In A.D. 224 Ardeshir, a descendant of Sassan and ruler of Fars and Kerman, rebelled against the Parthian king, Artabanus V, and established the Sassanian dynasty. Within twenty years, Ardeshir I (224-241) created a vast empire that stretched as far as the Indus. His son Shapur I (241-272) continued this expansion, conquering Bactria, and Kushan, while leading several campaigns against Rome. In 259, the Persian army defeated the Roman emperor Valerian at the battle of Edessa and more than 70,000 Roman soldiers were captured. For nearly four centuries, foreign wars and internal struggles gradually exhausted the Sassanian Empire and a new enemy, the Hephtalite Huns, defeated them. It was not until the reign of Khosroe I (531-579), one of the greatest Sassanian rulers, that the Huns were beaten. Khosroe I took Antioch in A.D. 540, while Khosroe II, who had rebuilt the empire until it rivaled that of the Archaemenians, laid siege to Byzantium in A.D. 626. However, the dynamic emperor Heraclius turned the tables, with the Byzantines invading Iran in 628. Khosroe II was deposed and murdered by his followers. 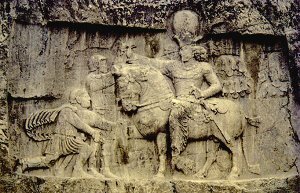 After his death, over a period of 14 years and twelve successive kings, the Sassanian Empire weakened considerably, and the power of the central authority passed into the hands of the generals. This paved the way for the first Arab attacks in A.D. 633.